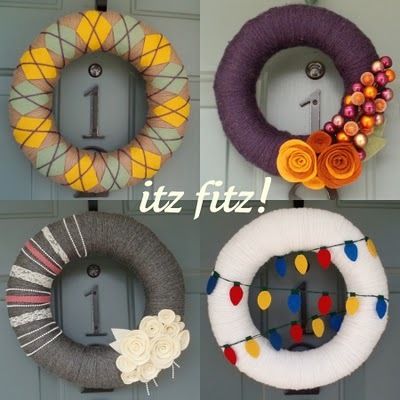 I saw these wreathes on Pintrest the other day and thought they were super cute. I saw notes that people were using pool noodles from the Dollar Store or even pipe installation from hardware stores (about $1 for 6 feet). Ry and I went over to a local thrift store this afternoon and I was on a mission to find fabric or ribbon to make a wreath from. I found some red ribbon and replacement Christmas light bulbs. We then headed to Lowes to pick up 'stick' of plumbing installation (since the local Dollar Store had already packed away their noodles for the summer). I came home and started working on it. Unfortunately the ribbon was a little thick and wasn't laying flat enough on the circle I made for the wreath. On the way home from church we hit up Michaels and I got some grey yarn. While we watched some of the late night football games I wrapped the tube (it took a little longer than I thought it would). Ry helped get the bulbs on the extra string of yarn. It is too late to take pictures tonight, so I guess I will have to post them tomorrow :) It is like a combo of the grey wreath and the white wreath from the picture.